I live and work in Crystal Palace, London. I've recently moved my studio to a tiny shop space on the fashionable eclectic Church Road in Crystal Palace. This means I have a fantastic shop window and enables customers to see me working and pop in to buy or order direct from me. The shop is accessed through the White Hart pub which is great if you fancy lunch and glass of wine after hat shopping! I use a mixture of vintage, traditional and new hat blocks and mostly work in wool felt, although, I do make straw or fabric hats on commission. Studio consultations are usually a chat over a cup of tea about the specifics of what my client wants. Is their hat for a special occasion or to complement their favourite coat? We discuss shapes, materials and colours using sketches, swatches and ribbons. Often clients bring items of clothing or pictures that inspired them. We take measurements, then stay in contact over the process of hat making, which can be anything from one to three weeks depending on complexity and existing demand. Please get in-touch if you have any questions. I'd love to hear from you. Or if you're in Crystal Palace come and see me! If you want to surprise a friend or loved one with the gift of a hat I sell beautifully printed gift vouchers removing the stress of choosing the perfect one. These are especially popular around Christmas and are usually available from the studio shop or contact me for further details. The vouchers can be used in full or part payment (depending on the chosen design) and are valid for 12 months from the purchase date. After completing a Fine Art degree in Birmingham, I moved to London. I worked for English Heritage then the civil service, but always retained a keen interest in all things creative, doing courses in stained glass production, then life drawing. As a full time mother I set up Vintagehart, a small vintage boutique, based in Crystal Palace, South London with my friend Annette. Vintagehart sold hand-picked vintage ladies clothing and accessories, the boutique was in business for over eight years. We made the ‘TIME OUT: Top 100 London shops’ in our second year. I’ve always been a hat wearer, but the beautiful range of vintage hats and headpieces I was selling, inspired me to do a millinery adult education course. I fell in love instantly. Here was something that could combine my love of fashion and clothes, with colour, craft and sculptural shape. I was hooked! 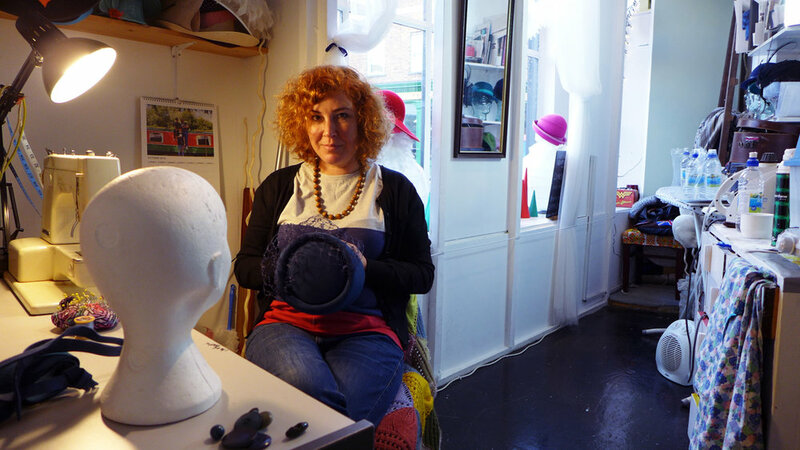 I began private tuition with my teacher and mentor Sue Dewhurst at her own millinery studio, before setting out on my own. I now sell my hats through the studio/shop in Crystal Palace and as private commissions for weddings, race meetings and occasionally costume for TV and theatre. When people hear that I'm a milliner, they often say, ‘Oh, I‘ve never suited hats’. This frustrates me. Anybody and everybody can look fantastic wearing a hat. It’s just a case of finding the right one, a hat that will do them justice, completing their look. I've learned a lot about what does and doesn't suit certain face shapes over the years. Matching colour, skin tones and hair types with the correct styles, shapes and materials is a rewarding part of the job. Vintage hats and headpieces from the 1930s to the 1980s still inspire my hats today as I mix traditional and contemporary looks. It's my aim to make affordable timeless everyday hats that add to your own personal style and make every day a special occasion. This site has been built to showcase a selection of my hats. Some were made as commissions and others sold from my studio/shop Many of my customers are local to Crystal Palace and South London area. I enjoy speaking to my clients, often in person at my studio during consultations or sometimes by phone or email. Many of the hats shown across this site will require you to contact me to discuss colours, materials or special requests, to ensure we get everything right. However I have made around 12 of my best selling hats available to be purchased right now through the online shop. Many thanks to Natasha for modelling and all her help with creative input.